ssh-agent is an utility that stores private keys and makes them available to other software that use the SSH protocol to connect to remote clients. We recommend that Windows users install MobaXterm in order to access the shell terminal which includes ssh-agent. When you run the ssh-add command you will be prompted to enter the passphrase that you specified when generating your SSH key pair. NOTE: The ssh-agent session will persist until killed or until system shutdown, even if you close the terminal in which you set it up. Mac users (OS X Leopoard onwards) can optionally benefit from linking the SSH key to Keychain, which securely stores the passphrase as well. This means that even after a reboot, your SSH key is always available in any Terminal session automatically. See man ssh-add and look for the -K option, if available. The "-A" argument is important because it enables "agent-forwarding". This means that your the information about your SSH private key is forwarded to your remote session on the login server so that you can use it for further SSH connections. (Windows users can enable X-forwarding in MobaXterm saved sessions). Can't login? Please check that you have been through the steps listed on the "Start here" page. Don't forget to check your network details. 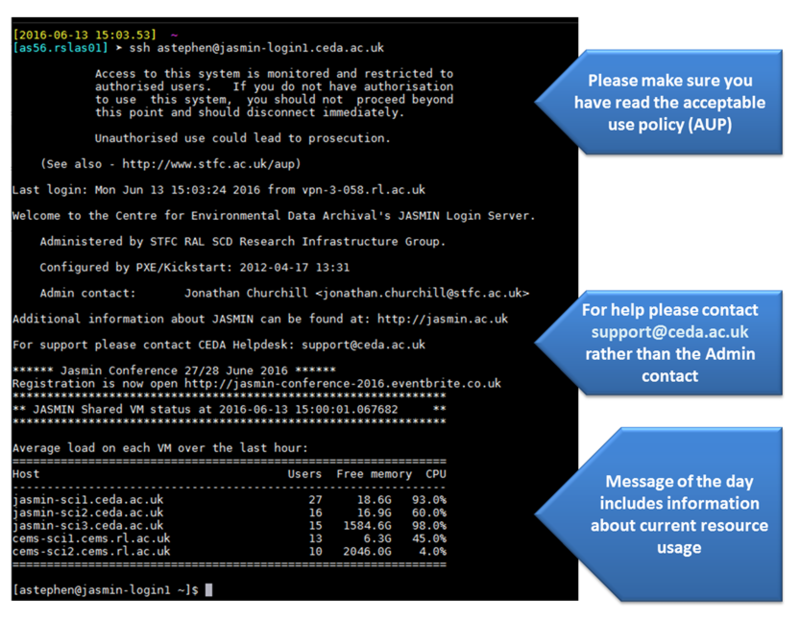 When you first login you will see a message that provides some useful information (see figure 1). Note that the -X argument can be used in conjunction with the agent-forwarding-A argument. Please note that this arrangement sends your graphical output back to your desktop machine over the network, so response times can be very slow. A more performant solution is currently being tested but is not operational yet. If you are asked for a password when trying to login it indicates that ssh key forwarding is not working correctly. Please check that you have followed the instructions for setting this up on your local machine. There is no point in trying to enter a password as only ssh keys are accepted. Note that once you are logged into the JASMIN domain (i.e. the login server(s)) then you can omit the <user_id>@ prefix before the server name.